SERIES HOM CENTRIFUGAL PUMPS (Model HOM-1/2V) horizontal pumps and centrifugal pumps are designed as an economical alternative for OEM applications which require high flow rates under moderate head conditions with minimum suction lift. A true volute design accompanied by a full diameter impeller creates a highly efficient, energy-saving pump since less horsepower is required. The true volute design eliminates shock losses, prolongs seal life, and produces smooth and quiet operation. The rear impeller vanes are designed to insure proper lubrication of the seal cavity while the central discharge of the pump housing prevents air locking. The HOM series horizontal pumps and centrifugal pumps are easy to assemble and disassemble. The pump bracket and half the volute are one piece. The V-band tightens and seals the front cover to the volute pump housing, thus eliminating the use of many housing cover nuts and bolts. The volute pump housing and cover are supplied in glass filled polypropylene and the impeller is CPVC. Totally enclosed fan cooled standard NEMA 56J frame motors are employed. The motors are supplied with mounting feet and a 7/16-20 UNF threaded shaft. Ethylene propylene (EPR) is the standard elastomer for O-rings and seal components. Viton is available as an option. A completely metalless Diplo seal is supplied containing a simple two-part design for higher reliability, lower leakage, easier installation, and minimized damage from dry running. Standard materials are carbon/ceramic/EPR. Carbon/ceramic/viton is available as an option. A unique quick release V-clamp is supplied in 300 stainless steel designed for applications which require frequent assembly and disassembly. The T-bolt passes through a notch in the strap or latch allowing the clamp to open without removing the knob. This threaded CPVC priming chamber aids in helping to prime the pump. An optional CPVC flapper valve with EPR elastomers and a 2” FPT inlet port is also available. PENGUIN SERIES HSC CENTRIFUGAL PUMPS (Model HSC-1/2MV) are corrosion-resistant, all-purpose 316L stainless steel pumps ideal for many O.E.M. and chemical processing applications, including many acids and alkalies, as well as solvents to 250ºF. 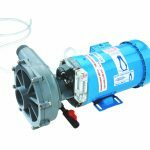 The high efficiency of this horizontal pump produces up to 90 feet of head. The HSC series pump is widely used for transfer of non-flammable, nonabrasive fluids which are compatible with pump component materials including cleaners, caustic materials, salt solutions, chlorinated solvents, and de-ionized water. Wet ends are available separately for placement on customers’ own motors. Penguin series HSC pumps are supplied with an EPR/ mechanical seal. Optional seals include Viton®/carbon/ceramic and Viton®/silicon carbide/silicon carbide. A double mechanical seal available in the same materials with water flush can also be supplied. The pump is directly coupled to a 3450 RPM, ball bearing motor. All motors are totally enclosed fan-cooled. Single-phase motors are wired 115V and supplied with a cord and plug. Three-phase motors are shipped unwired. Ethylene propylene (EPR) is the standard elastomer for O-rings and seal components. Viton® is available as an option. Pedestal bearing bracket, pump head, and motor are mounted on a common polypropylene base. For high pressures to 110TDH, a multi-stage pump is available. PENGUIN SERIES HV HORIZONTAL END SUCTION PUMPS Series HV Horizontal Pumps End Suction Centrifugal pumps are designed to the latest hydraulic technology. A true volute design provides an energy saving pump because less horsepower (HP) is required. The HV series horizontal pumps has a higher flow versus pressure, yet very smooth and quite operational. The volute design helps to reduce vibrations and shock losses, premature shaft fatigue and bearing failures, and radial thrust loads while prolonging mechanical seal life. The rear impeller vanes are designed to help assure proper lubrication of the mechanical seal cavity while balancing axial forces hydraulically. Penguin series HV horizontal pumps are easy to assemble and disassemble. The pump bracket and half the volute are one piece, constructed of CPVC, there is no metal contact with the solution being pumped. If the HV series pump should accidentally run dry excessively, usually the seal insert can be replaced in lieu of replacing the entire pump housing/motor bracket assembly, thus saving costly repair/replacement dollars.